University of Washington, United Nations research: world population will be 9.6 to 12.3 billion by 2100. Only a few decades before this starts looking really familiar. It’s difficult to forecast how the world’s population will change in the next hundred years or so. Some researchers think it could decline, and others say there’s nowhere to go but up. 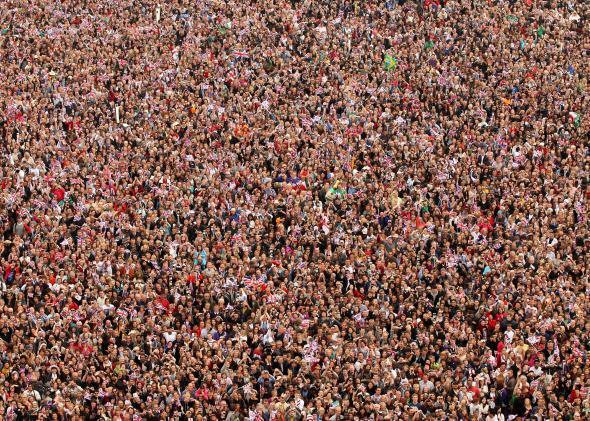 A new study published today in Science sides with the latter camp, forecasting that by 2100 the human population will have increased to between 9.6 and 12.3 billion. The research, which was led by the United Nations and University of Washington, comes to similar conclusions as a 2013 report by the group. Both this new study and the one from 2013 used advanced statistical modeling on life expectancy and fertility data to narrow the U.N.’s previous range of estimates for the population in 2100. The U.N. prediction was formerly 7 billion to about 17 billion—a range that’s too large to really be helpful. But the 2013 study brought the forecast to between 9 billion and 13 billion. Today’s findings narrow the range further to a spread of 2.7 billion. Most of the growth is forecast to be in Africa, where the current population of 1 billion is predicted to grow to 4 billion by 2100. The study cites large family size and lack of access to birth control as factors that may contribute to the sharp rise. But it also notes that family planning initiatives and better access to contraception could reduce the increases the researchers are predicting both in Africa and worldwide.